How to recycle computer equipment safely? By recycling one million laptops, we can save the electricity consumed by 3,500 American households in one year, according to the EPA. This is one of the many reasons why we should recycle our old electronics. In 2009, only 38% of older computers that had reached the end of their useful life were recovered for recycling, and this percentage was even lower for cell phones (8%). Concerns about privacy and data theft are often cited as reasons why people cling to old electronic devices. How to ensure that a laptop’s hard drive is unreadable or that personal data has been deleted from a cell phone? 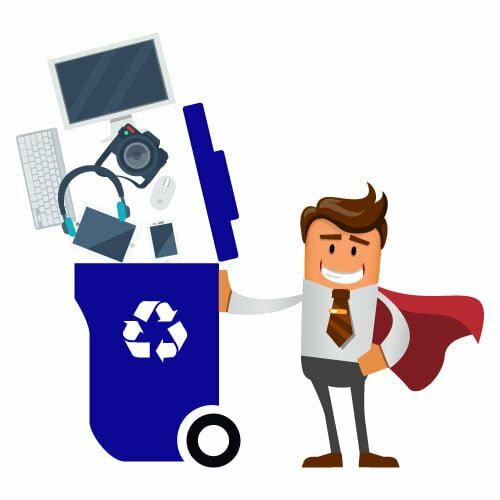 Here is some information that will guide you in saving your personal data before you recycle your computer equipment. Move your files. Your main concern will probably be to remove important files from your machine. This allows you to sort the ones you want to keep or not. Invest in a hard drive or use a third-party synchronization tool such as Dropbox to transfer important files. For security reasons, back up your data on the cloud and on an external machine. In case of failure, you will have two copies of your files. Once you have ensured that your data is backed up, you can delete all this information from your device. For laptops and desktops, this will require special software because it is not enough to delete your files or reformat your hard drive. There are programs that can recover deleted data if your hard drive has not been disinfected properly. If you have a PC, you can download a program like Darik’s Boot and Nuke (DBAN) or KillDisk and then burn it to a CD or USB stick. For Mac users, Apple provides detailed instructions on how to safely delete your data. Instead of using a downloaded program, start your computer using its installation disk, then use your system’s Disk utility to perform the deletion. For Macs and PCs, you can choose how many times you want to write to the files. The more you write your data, the more secure it is, but keep in mind that the operating time increases considerably the more often you overwrite it. For added security, you may consider encrypting all your sensitive files before deleting them. A data recovery program could potentially restore a file, but would not be able to decrypt it. To delete data from a cell phone, EPA suggests deleting all information and following the manufacturer’s instructions to perform a factory hardware reset. Then remove the SIM card from your phone and cut it in half. With any of your electronic devices, if you prefer not to deal with the erasure process yourself, consult a technology professional. Overwriting data on your computer or device will most likely prevent anyone from accessing your personal information. Lifehacker notes, however, that someone with the training, time and money to recover your data could still recover it. This scenario is very unlikely, but if you are worried – and do not intend to give the device away for reuse – think about damaging the device or its hard drive yourself. Be careful if you intend to hit a hard disk with a hammer or drill. If your computer or device is still working, consider donating it to a charity. In Quebec, OPEC provides computers to schools. In France, Don Ordi is a directory that will help you find an organization that redistributes used computers. In Belgium, Solidarité Informatique Sans Frontières is an association that provides free computer equipment to associations and disadvantaged people. How to make your website green?